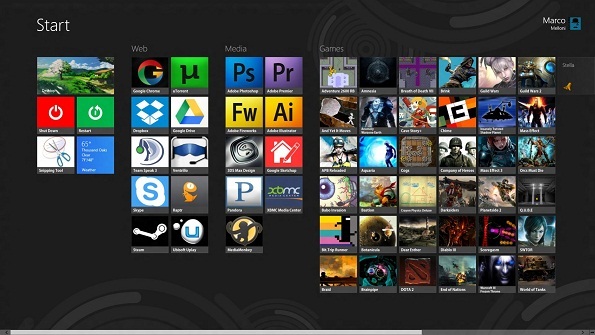 There’s quite a fair amount of discussion on the Windows 8 Start Screen / Menu but love it or hate it, it’s here to stay. While there are a few Windows live tiles that is streamlined with the overall theme, non-modern UI programs had small icons and well, just look crappy. Now there’s a fix. OblyTile (available on XDA-forums) lets you create customised tiles. It allows you to load your own image files and not just windows executable but can also load up direct links in the immersive mode (i.e. full-screen modern UI mode). Tiles are limited to the default sized square tile though but hopefully this would be expanded in future versions. Start by entering a Tile Name, it can be unique and entirely up to you. Having a unique Tile Name would make searching easier on the Windows 8 Start Menu. If you don’t like seeing the tile names, you can choose to Hide Tile Name by ticking the box. I have been using Windows 8 for over a month now. Conclusion: I don’t miss the Start Menu, in fact I kinda like the whole full-screen start menu as it makes it easier (and quicker) to launch applications. The full screen immersive mode applications are also pretty good – like the email client and their corresponding notifications, messenger app and also the facebook client. I have been using them quite frequently and generally prefer them over their web application counterpart. If you were wondering how to create Shutdown / Restart / Suspend Tiles in Windows 8 – well, its covered in my original Windows 8 review or its also much easier with OblyTile. Just create the new shortcut pointing to shutdown.exe -s -t 00 (shutdown) and shutdown.exe -r -t 00 (restart).